Twenty-six years ago this October, the San Andreas Fault jolted awake, rocking the San Francisco Bay area. At magnitude 6.9 and lasting roughly 15 seconds, the Loma Prieta earthquake was significantly milder than the fault’s previous major event, the great 1906 earthquake, yet damage from the 1989 quake, estimated at $6 billion by the U.S. Geological Survey, reached throughout the region. Transportation infrastructure proved especially vulnerable to the quake’s destructive force. More than 60 miles (97 km) north of the epicenter, the gaping upper deck of the San Francisco–Oakland Bay Bridge, where one person died, and the collapsed Cypress Street Viaduct in Oakland, where 42 people perished, became iconic images of the event. In San Francisco, the earthquake crippled two major freeway structures, giving the city an unexpected opportunity to turn back the clock on one of the most contentious periods in its development. What followed was an unusual turn in San Francisco’s history of activism: a neighborhood called for greater density, less parking, contemporary design, and more affordable housing—and became a model for forward-looking neighborhood redevelopment. Decades before the Loma Prieta earthquake, the construction of two double-decked freeways—the Embarcadero Freeway, connecting the Bay Bridge to the northern waterfront, and the Central Freeway, which cut northward through the city—had San Franciscans up in arms. Alarmed by the impact of these structures and plans for a network of more “trafficways” crisscrossing the city, communities organized, and by 1966 the Freeway Revolt, as the movement came to be known, ended plans for any future freeways. That victory did not undo history, however, and over time those elevated roadways became San Francisco fixtures. By 1989, when earthquake damage to the freeways spurred renewed calls for their permanent removal, new factions had emerged. In the case of the Embarcadero, opposition from Chinatown and other neighborhoods served by the freeway failed to turn the tide on decades of political momentum favoring its removal. Demolition began in 1991, and the Embarcadero reemerged in 2000 as a new boulevard with a fleet of historic streetcars from San Francisco, as well as across the United States and the world. In contrast, efforts to remove the Central Freeway became an epic battle pitting the neighborhoods of Hayes Valley and the Western Addition against the city’s western neighborhoods and Marin County–bound drivers, who wanted the structure not only rebuilt, but also widened. From 1997 to 1999, a series of four ballot measures for and against the freeway’s removal ensued. The city, meanwhile, had come forward with a proposal for a new boulevard designed by former San Francisco planning director Alan Jacobs and Elizabeth MacDonald, both internationally recognized experts in boulevard design. The new Octavia Boulevard would channel and disperse cross-city traffic from a new freeway terminus at Market Street, while slower, separated lanes for local traffic and cyclists would buffer the thoroughfare’s wide sidewalks. The boulevard would end at a large central green, diverting traffic from the neighborhood’s main retail center on Hayes Street. Prop. I complemented California Senate Bill 798, which transferred the former state highway land to the city, free, with stipulations that proceeds from land sales would fund the construction of Octavia Boulevard and other streetscape improvements around the point where the shortened Central Freeway structure comes back to grade. With a clear vision and funding mechanisms in place, the voters in 1999 approved Prop. I. Ten years after the earthquake, the city could finally move forward. The rise of Hayes Valley as one of San Francisco’s most desirable neighborhoods now seems as if it were predestined. With the freeway gone, the area’s central location, fine-grained residential streets, active commercial center, and convenient access to transit make for an ideal urban lifestyle. What is less obvious to the casual observer is the vision that shaped the neighborhood’s success. The planning effort was conducted under San Francisco’s Better Neighborhoods program, a series of focused plans intended to encourage sensitive development in areas expected to experience significant growth. The Market and Octavia Area Plan covered a swath of land at the nexus of two major city thoroughfares—Market Street and Van Ness Avenue—that includes the approximately 7 acres (2.8 ha) comprising the 22 Central Freeway parcels. The Planning Department conducted extensive community outreach, including meetings, walking tours, and bus tours to other neighborhoods to understand, from the residents’ perspective, what was working in Hayes Valley, what needed to change, and what new solutions might be considered. The Hayes Valley Neighborhood Association, an organization spawned by the freeway fight, held separate community forums and worked closely with the Market-Octavia planning team. These sentiments informed the plan’s underlying premise: in a neighborhood supported by transit, walking, and cycling, a dramatic reduction in accommodations for cars allows for the construction of more housing and better mixed-use development. This, in turn, strengthens the area’s vitality and character. With the community’s support, the Market-Octavia plan replaced parking minimums with parking maximums, typically 0.5 spaces per housing unit, and mandated unbundling of parking from units to provide a broader range of affordability. Finally, the plan’s guidelines for urban and streetscape design encouraged active, engaging, and safe streets for walking, cycling, and other transit modes. Although it would take another eight years for the city to adopt the Market-Octavia plan, most of its pioneering provisions remained intact. Together these policies stimulate higher density, a mix of neighborhood-serving and destination retail businesses, and pedestrian-friendly streets that foster community. The neighborhood was not content with just sound planning. While the draft plan underwent environmental review and other approvals, Levitt and architect Stefan Hastrup convinced the city and a coalition of influential organizations—including San Francisco Beautiful, the American Institute of Architects, SPUR (the San Francisco Planning and Urban Research Association), and the San Francisco Museum of Modern Art—to hold an international design competition inviting architects worldwide to propose housing concepts for six lots along Octavia Boulevard. “The design competition set a high bar and helped the city to realize good projects,” says Kearstin Dischinger, a senior community development specialist at the San Francisco Planning Department. “We now look to Octavia Boulevard as a grand part of the city.” The goal was to elevate and expand the conversation about the kind of innovation in housing that might be realized on the new parcels and to signal to the city and real estate developers that the neighborhood embraced contemporary design—an anomaly in a city known for cherishing its architectural past. 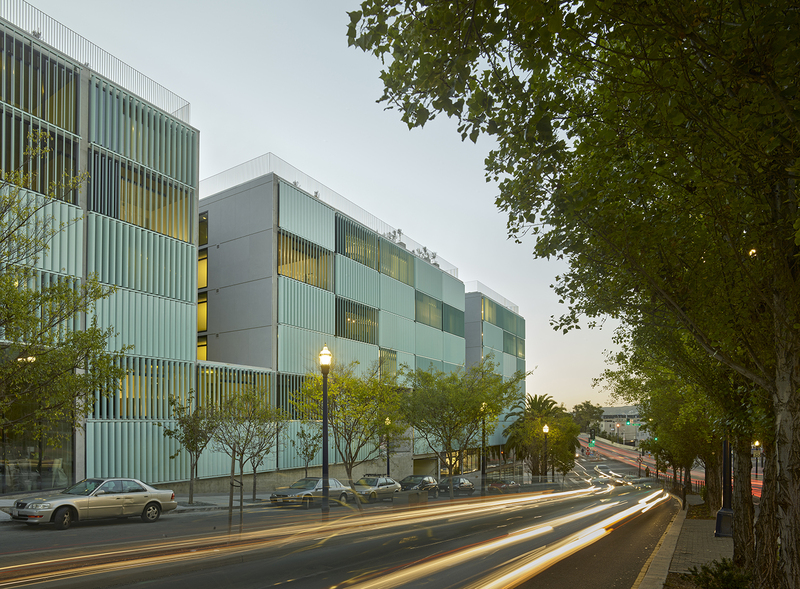 A year later, in 2006, when the Mayor’s Office of Economic and Workforce Development requested proposals for the first market-rate developments along Octavia Boulevard, the request for proposals stressed the importance of design. The winning teams, all based in the Bay Area, included two finalists from the international design competition, Owen Kennerly and Envelope A+D, along with Stanley Saitowitz|Natoma Architects. Against the backdrop of the dot-com and housing bubbles, the 2002 agreement to sell seven of the 22 parcels to the SFRA accomplished another important goal: it secured those sites for affordable housing. But the Market-Octavia plan goes further, distributing affordable housing sites throughout the plan area and recommending that additional affordable units be spread among different housing types. This latter goal is accomplished through San Francisco’s inclusionary housing program, which requires that multifamily developments make 12 percent of units available at below-market rates. Altogether, the city anticipates that nearly half the 1,000 units planned for the freeway sites will serve those with special needs, including the formerly homeless, people with developmental disabilities, low-income seniors, and low-income families. City making takes years, and in this respect the Market and Octavia Area Plan has another lesson to offer. The Board of Supervisors finally adopted the plan in March 2008, just months before the country plummeted into the Great Recession. With land values down, the city tabled its plans to sell parcels along Octavia Boulevard. But affordable housing projects with funding in the pipeline were able to move forward, allowing implementation of the plan to progress even amid economic collapse. The Mayor’s Office of Economic and Workforce Development, hearing neighborhood concerns over the prospect of vacant sites along Octavia Boulevard languishing for years, invited proposals for temporary uses. An urban farm, a community garden for the homeless, and Proxy, a mixed-use commerce and culture hub, brought community energy to the sites and generated modest lease income for the city. However, the program comes with risks: despite clear agreements intended to protect future development plans for the sites, activists briefly challenged the scheduled closure of the urban Hayes Valley Farm. Nonetheless, the temporary uses enjoy broad community and city support. While Hayes Valley is now a desirable San Francisco location, the neighborhood and the plan area remain in transition, and new issues are arising. As in much of San Francisco, middle-income earners in Hayes Valley are finding fewer housing options available, and growth in the region overall is straining the boulevard’s capacity to handle automobile traffic. But the community has prompted the city to examine ways to calm traffic in the area and improve safety for pedestrian and cyclists. “The plan won’t be done until the traffic issues are addressed,” says Levitt. For the community and the city, the work of cultivating a good neighborhood never ends. Yosh Asato is a communications consultant specializing in architecture and urban design, and a cofounder of TraceSF.com, an online journal covering urbanism in the San Francisco Bay area.